Named for influential Quaker poet and abolitionist John Greenleaf Whittier, Whittier Elementary stood two-and-a-half stories tall at the corner of Minnesota Avenue and South Street on Minnesota Point. The six-room frame building opened in 1892 to serve students living on the northern half of Minnesota Point (Radisson School, later renamed Lafayette Elementary, served the southern half). In 1895 Whittier boasted an enrollment of 242 students, but by 1901 that number had dropped to just 103. The school closed in 1919 and was demolished about four years later; a house now occupies the lot. 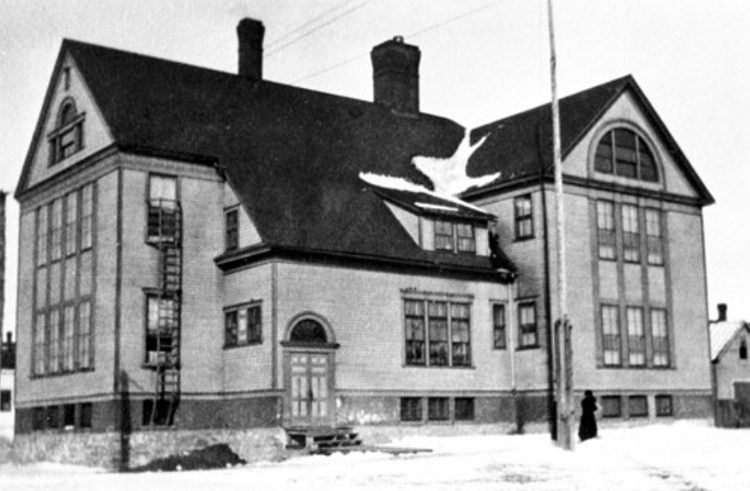 Note the ladder at the left side of the school, extending down from a second-story window to the ground; that was the school’s fire escape.